GLENDALE — John Chayka doesn’t care what you think. The draft strategies of the Arizona Coyotes’ president of hockey operations and general manager are not dictated by Twitter voices or pundit’s evaluations, they’re reliant on “core philosophies and methodology” that require the organization to stay disciplined on draft night. On Friday, Chayka and Co. did just that. After left winger Brady Tkachuk, the son of former Coyotes great Keith Tkachuk, was taken by the Ottawa Senators with the fourth pick, the Coyotes trusted their evaluation and took their guy at No. 5, center Barrett Hayton. That thought process was not embraced by most fans. They became apoplectic on Twitter, overcome with frustration watching the 29-year old Chayka pass up on Czech right winger Filip Zadina. “There’s a lot of passion, a lot of emotion around pro sports and I think our group has conviction over what we were doing,” Chayka said Monday. “It’s not easy. I can just tell you, you have these discussions about what’s perception going to be. Zadina was projected to go No. 3 and No. 5 in the Sporting News and The Athletic’s mock drafts, respectively. In those same two mock drafts, Hayton was projected to fall to No. 19 and No. 12. The Canadian center’s value at No. 5 was questioned by some. Barrett Hayton (center) poses for a photo with team representatives, including GM John Chayka (left), after he was selected fifth overall pick by the Coyotes in the first round of the 2018 NHL Draft at American Airlines Center in Dallas. Others agreed. 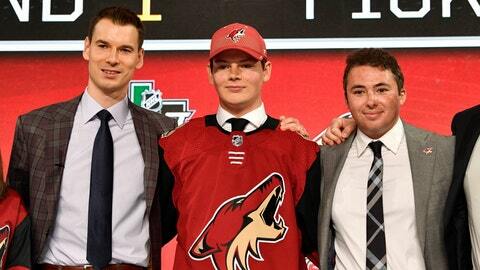 But two days after Keller finished third in the Calder Memorial Trophy (the NHL’s Rookie of the Year award), the selection of Hayton perhaps served as a reminder for fans to trust Chayka and, despite many long and suffering years, trust the Coyotes organization. If it wasn’t public knowledge by now, Chayka admitted Monday the team is going through a rebuild. Getting to the playoffs would be an accomplishment but they’re looking for something that’s long been dormant in the desert: long-term success. It’s a daunting undertaking but one that other franchises have carried out. 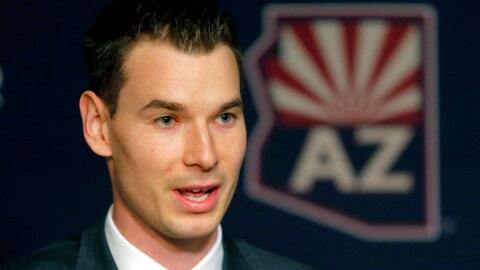 Chayka has looked to those that have achieved it and found similarities. “When I look at teams that have had success … they build through the draft, they build up the middle,” the Coyotes’ GM said. Both Keller and Hayton are centers. That’s not a coincidence. To Chakya, it’s a premium position. Great centers are all but impossible to bring in. Only a handful exist and each costs a premium. “Being that play-making center through the middle of the ice, that dedicated 200-foot guy, that’s why those centers that are like that are impossible to acquire,” Chayka said. Chayka, though, believes he just grabbed one. The third-year GM can’t help but grin as he describes the 18-year old to the media, almost assessing the selection as one that generic talent evaluators dismissed because of the 6-foot-1, 190-pound lefty’s completeness. “The way I kind of view Barrett is that everyone wants that kind of one thing that jumps off that page at you and it’s easy to see and grab on to,” Chayka said. “Whether it’s his athleticism, whether it’s his underlying data, whether it’s our in-person views, whether it’s our video views, across the board he checked all the boxes. Some will argue with that notion. But like Billy Beane in “Moneyball,” Chakya believes his strategy and philosophy will garner a contender in due time. Hayton said he had a “good vibe” with the organization after meeting with them at the NHL Combine. He had the chance to sit down with them and hear first-hand their plans for building a winning hockey team. “I know on my behalf I was very intrigued with this organization and we kind of talked about their mentality and really the process they have in play to develop their players,” he said. Chayka and the Coyotes have their blueprint. Their going to stick to it despite the opinions of others and hope it’s executed precisely how they’ve drawn it up.